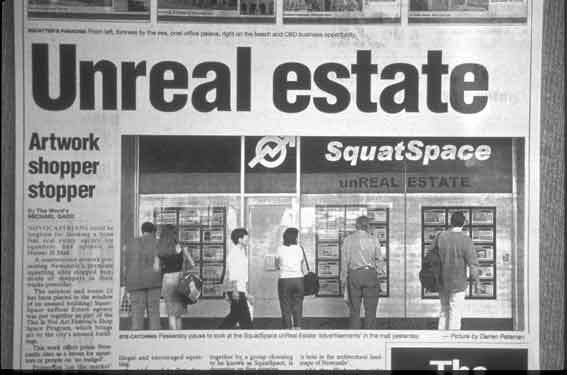 This Is Not Art festival, Newcastle, October 2002: Sydney artist group SquatSpace sets up a professional-looking unReal Estate shop in the Newcastle Mall, advertising empty buildings as potential squats. Astonished passers-by are stopped in their tracks by what appears to be a genuine real-estate office. Featured in the window are more than 40 abandoned, empty or disused local buildings, ranging from the city’s classically styled former GPO and concrete-bunker World War II defence architecture to dozens of boarded-up shops and office buildings. Newcastle suffered a severe earthquake in 1989, and hundreds of jobs were lost when BHP closed down its steelwork operations in the late 1990s. These events drove people from the city, leaving a hole in the local economy and surplus urban real estate.